Nanoencapsulation of Food Bioactive Ingredients: Principles and Applications brings different nanoencapsulated food bioactive ingredients, their structure, applications, preparation, formulations and encapsulation methodologies, covering a wide range of compounds and giving detailed examples of the issues faced in their nano-encapsulation. 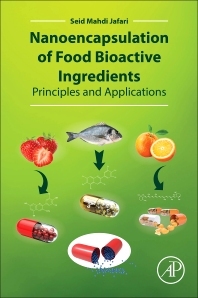 The book addresses findings related to the study of natural food colorants, vitamins, antimicrobial agents, phenolic compounds, antioxidants, flavors, essential oils, fish oil and essential fatty acids, and other related ingredients. As a definitive manual for researchers and industry personnel working, or interested in, various branches of encapsulation for food ingredients and nutraceutical purposes, users will find this a great reference. Dr. Seid Mahdi Jafari received his PhD degree in 2006 in Food Process Engineering from the University of Queensland, Australia. He has been working on the nanoemulsification and nanoencapsulation of food ingredients for the past decade. He is Associate Professor in the Department of Food Materials and Process Design Engineering, Faculty of Food Science and Technology, University of Agricultural Sciences and Natural Resources, Pardis, Basidj Square, Gorgan, Iran, and he is an academic member of GAU (Iran). He has published more than 85 papers in top-ranked international food science journals and 18 book chapters, along with editing four books with LAP and Elsevier publishers. In November 2015, he was awarded as one of the top 1% scientists of the world with the highest citations by Thompson Reuters (Essential Scientific Indicators) in the field of Biological Sciences.